With the advent of the Internet of Things (IoT) era, strong demand has grown for wearable and transparent displays that can be applied to various fields such as augmented reality (AR) and skin-like thin flexible devices. However, previous flexible transparent displays have posed real challenges to overcome, which are, among others, poor transparency and low electrical performance. To improve the transparency and performance, past research efforts have tried to use inorganic-based electronics, but the fundamental thermal instabilities of plastic substrates have hampered the high temperature process, an essential step necessary for the fabrication of high performance electronic devices. As a solution to this problem, a research team led by Professors Keon Jae Lee and Sang-Hee Ko Park of the Department of Materials Science and Engineering at the Korea Advanced Institute of Science and Technology (KAIST) has developed ultrathin and transparent oxide thin-film transistors (TFT) for an active-matrix backplane of a flexible display by using the inorganic-based laser lift-off (ILLO) method. Professor Lee's team previously demonstrated the ILLO technology for energy-harvesting (Advanced Materials, February 12, 2014) and flexible memory (Advanced Materials, September 8, 2014) devices. The research team fabricated a high-performance oxide TFT array on top of a sacrificial laser-reactive substrate. After laser irradiation from the backside of the substrate, only the oxide TFT arrays were separated from the sacrificial substrate as a result of reaction between laser and laser-reactive layer, and then subsequently transferred onto ultrathin plastics (4μm thickness). 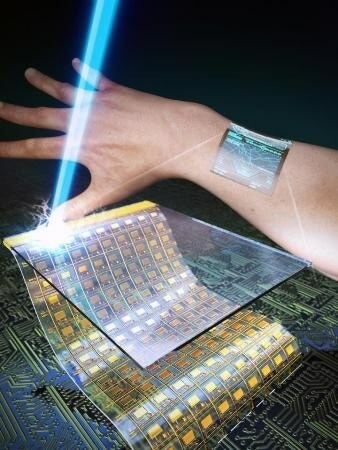 Finally, the transferred ultrathin-oxide driving circuit for the flexible display was attached conformally to the surface of human skin to demonstrate the possibility of the wearable application. The attached oxide TFTs showed high optical transparency of 83% and mobility of 40 cm^2 V^(-1) s^(-1) even under several cycles of severe bending tests. Professor Lee said, "By using our ILLO process, the technological barriers for high performance transparent flexible displays have been overcome at a relatively low cost by removing expensive polyimide substrates. Moreover, the high-quality oxide semiconductor can be easily transferred onto skin-like or any flexible substrate for wearable application."